Lt. 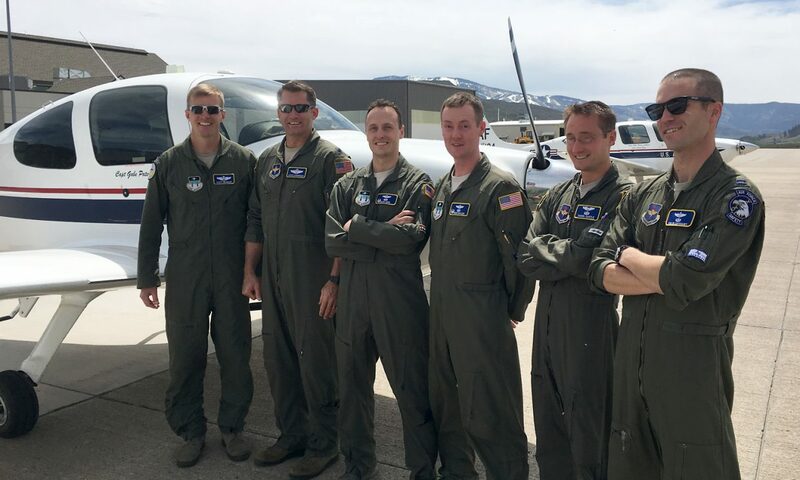 Colonel Alex Winn (third from left), and Major Eddie Ballew (third from right), were among U.S. Air Force personnel based at the Air Force Academy in Colorado Springs who flew to Steamboat Springs Airport in three Cirrus SR20 single-engine prop planes, now designated T-53 trainers. The fliers brushed up on mountain flying while treating Winn and Ballew to a "fini-flight," as they go off to other assignments, Winn in F-16 fighter jets and Ballew in KC135 Stratotankers. STEAMBOAT SPRINGS — A trio of U.S. Air Force Cirrus SR20 single-engine prop planes touched down at Steamboat Springs Airport at 11 a.m. May 9 after a 90-minute flight from their base in Colorado Springs. If the sleek and fast Cirrus doesn't fit your expectations for what military aircrafts look like, it's because these planes are among two dozen prop planes based at the Air Force Academy where the planes are deemed ideal to introduce the cadets to flying. With the cadets all in final exams this week, it was an ideal time for the more senior personnel to take a mountain flying orientation trip to Steamboat Springs Airport/Bob Adams Field. It was also an opportunity for a "fini-flight," or final flight, an Air Force tradition that grants personnel, who are being reassigned or retiring, a flight of their choice to mark the change. In this case, Lt. Colonel Alex Winn (call sign Splash) and Major Eddie Ballew (call sign Mogli) were being treated to a fini-flight because they are going on to assignments. Winn will return to flying F16 fighter jets. And Ballew will return to flying the KC135 Stratotanker, an aerial refueling aircraft. The crew left the airport and headed straight to Creekside Café for lunch — Winn's choice. He is familiar with Steamboat because he and his wife are looking for a home here. The Air Force chose the Cirrus aircraft in 2011 and designated them as T-53A trainers to replace a fleet of pilot trainers, the Diamond Aircraft DA 20, an aircraft which is still used elsewhere by the Air Force. The new aircrafts were delivered with the Cirrus Airframe Parachute System, airbag seat belts, an integrated roll cage in the fuselage and up-to-date avionics. Most first-year, or fourth class, cadets at the Air Force Academy are exposed to airmanship through four glider flights. By their third year, about 50 percent of cadets are enrolled in a soaring course with the chance to pilot and solo in a sailplane. First-class cadets have the opportunity to get involved in the Academy's power flight program, where military instructors provide a basic introduction to Air Force pilot training in the T53s. Based on proficiency, 50 percent of those involved will solo.